I found this project on thingiverse and decided I had to give it a try. 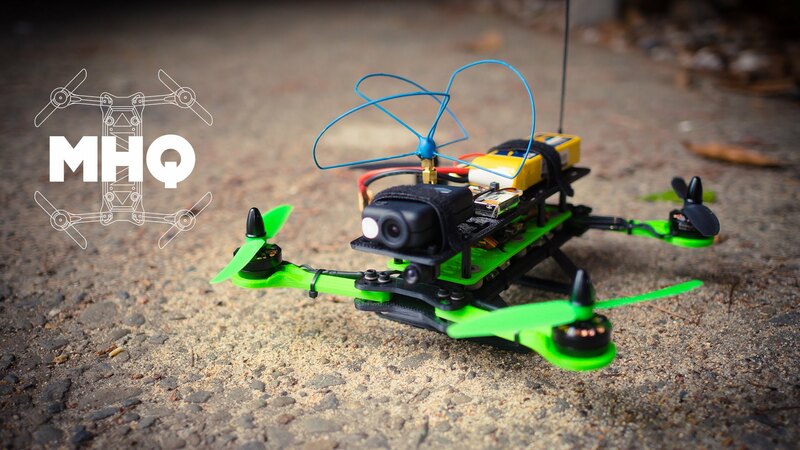 Hovership has created a 3d printable mini racer quadcopter called the MHQ2 and has posted the 3d printable STL files and even a nice build guide online for free. This copter was also featured in a recent issue of MAKE: Magazine. Enough people had already built these that the bugs are already worked out of it. The entire thing shouldn’t take more than a weekend of work. You could probably put it together completely in 1 day if you had everything ready to go. Since the copter itself is very small it does not use very much filament. I printed the entire frame in about 2 days. A couple of the frame plates are very large however and I had to print at least one of them diagonally on my Ultimaker 2 in order for it to fit. There are also a lot of additional or remixed parts on thingiverse to suit different people’s needs. The cost for this entire build (assuming you already have a radio controller) not including FPV camera gear, is about $225. Of course it’s always possible to spend more or less than that but that was the total for the components I chose. Similar to before, I’ve compiled the relevant YouTube videos here for your convenience.